Creative Daze! 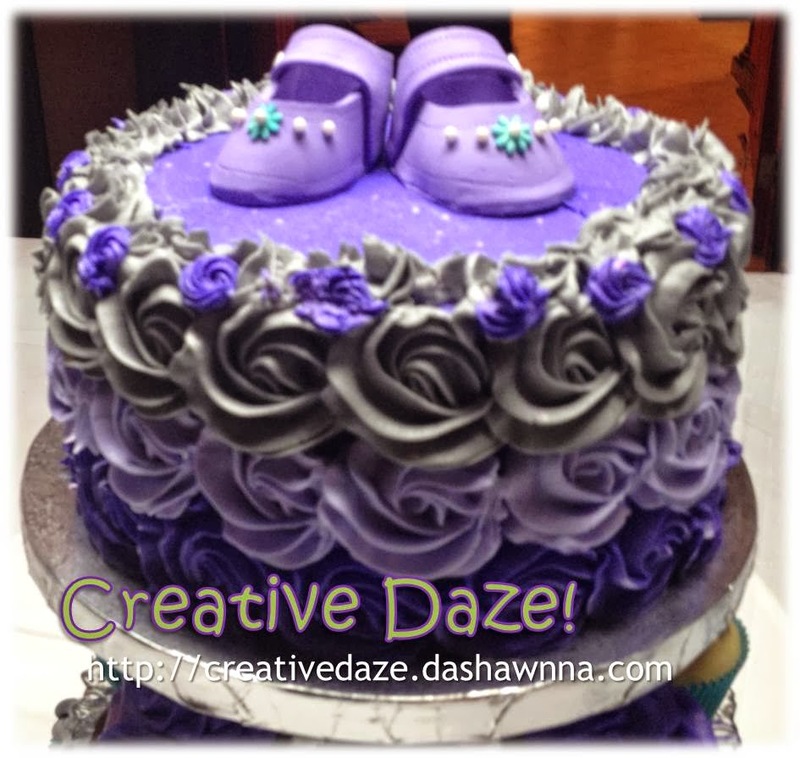 : A Sweet Little Baby Shower! A Sweet Little Baby Shower! Wow- I can't believe October is just around the corner! The arrival of fall will bring a new arrival for one of my co-workers- a little baby girl! So you know what that meant: a Baby Shower!! The guest of honor's favorite color is purple, so I coupled shades of purple with a light gray for my color scheme and decided on the theme: "sweet baby girl". I teamed up with my newly acquired Silhouette Cameo to create the centerpieces; SVG files are my new favorite thing! (I know...I'm so late! LOL) I knew I wanted to do a cube of some kind, so I downloaded an elephant, giraffe, and butterfly from the Silhouette Online Store to go around the sides. 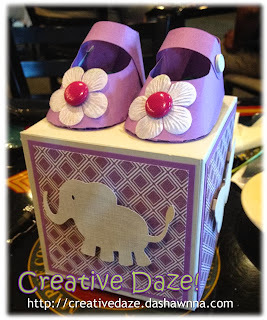 But I wasn't sure what to put on top of the cube--until I found this ca-utest little baby shoe on the Cute As A Fox blog! I knew then that I had found the perfect final element! 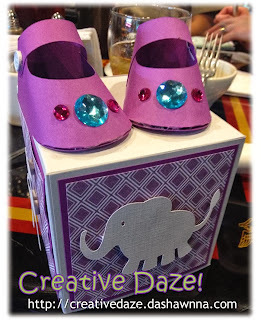 I created the shoes in pairs using various shades of purple and decorated the toes-- these have to be some of my most favorite decorations to date! Another co-worker took care of ordering the cake and the amazing thing about it was that, while I didn't really talk with her about what I was doing with the centerpieces-- the cake features a pair of baby shoes at the top! I love it when a plan comes together! 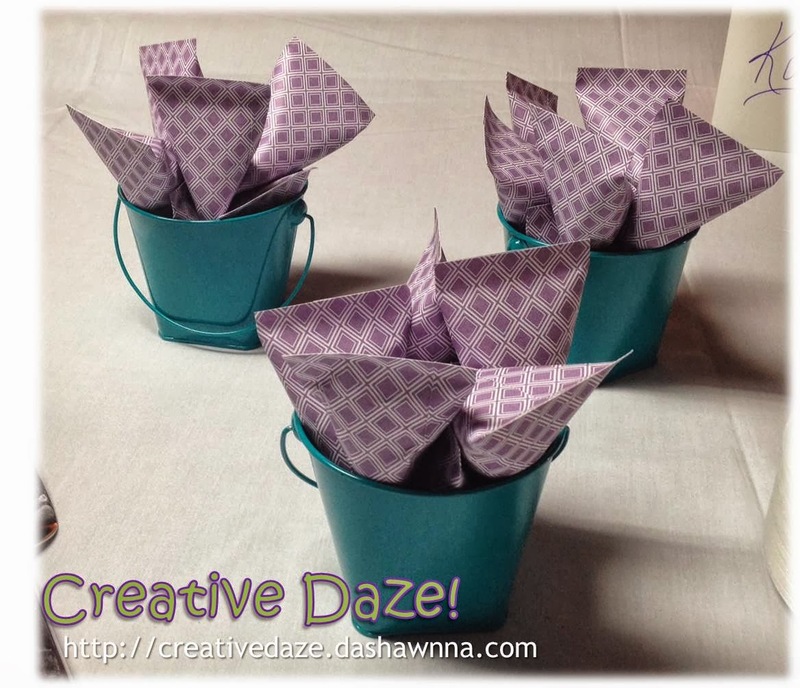 For the favors, I used matching patterned paper to make the sour cream containers I found on Splitcoaststampers. I popped a couple of soft mints inside--perfect for after lunch! All of my co-workers pooled our resources to give the guest of honor a nice gift card, so I knew I wanted to make a nice card to present it in. I made a 5X7 card so it would be large enough for everybody to sign it. 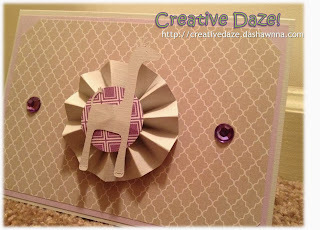 Some coordinating paper, a giraffe on a rosette, and a little bit of bling-- and the card was done! 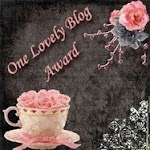 The rosette really made the card for me! This baby shower was so much fun! My co-worker really seemed to enjoy herself (and the cake)! I'm so glad!! Thanks for stopping by and I'll see you after my next Creative Daze! Hey, this is a wonderful Sweet Little Baby Shower!! It was a stunning post that made my day. On last Saturday Night I too hosted a bridal shower dance party for my cousin and it just turned out to be a successful bash of my life. I had booked one of the best NYC venues for this garden party that I had booked from an online portal. ::NEW PROJECT:: A Baby Book!